This dish is inspired by the great Phil Rosenthal. Myself and Fabio have devoured Somebody Feed Phil on Netflix in the last few weeks, pun intended. If you haven’t watched it yet I highly recommend it, Phil is probably one of the most lovable and enthusiastic people I’ve ever watched on TV and he’s so passionate about food that he makes you want to go eat, as if we need encouragement! In one of the episodes Phil visits Venice and goes to eat a breaded pork chop (cotoletta) in a small restaurant called Da Arturo. We decided, knowing how good the non keto version is, that we have to ketofy this! Enjoy. Prepare the pork chops by flattening them with a meat mallet until the meaty part is nice and evenly thin. Set them aside and cover them. In a food processor put the pork rinds and the grated parmigiano reggiano, add some ground pepper and a pinch of salt. Process until the pork rinds are reduced to powder and well mixed with the cheese. Pour into a large bowl. In another large bowl whisk the eggs well, and season them with salt and pepper. In a third bowl put the coconut flour, start with 5 tablespoons, you can always add more. In a pan pour enough olive oil to allow the steaks to fry slightly submerged. You will have to turn the pork chops over anyway so there’s no need to use too much oil. Bring the oil to heat, ~150 degrees Celsius (you might have to adjust the temperature – lower it if the oil starts smoking or raise it if the pork chops are not frying happily away). 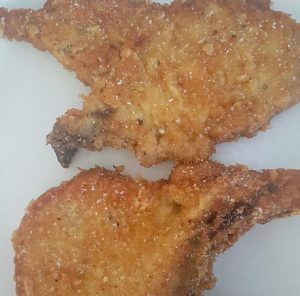 When the oil is in temperature, take one pork chop at a time and dip it into the coconut flour first (both sides), then put in the whisked egg (both sides) and then in the breading preparation (again on both sides). Make sure that all steps are evenly coating the pork chops. When done, carefully place the coated pork chop in the pan and quickly do the following one, until the pan is full. Let them fry for 2 or 3 minutes per side. Check them regularly. Use strong tongs to turn the pork chops over, in the same order in which you put them in. Make sure that the side that was down is golden brown. Cook the other side for another 2 or 3 minutes, until golden brown. Once done move the fried pork chops to a plate covered in kitchen towel (plain white, ideally) and cover them. Redo the same process for the remaining pork chops until they are all well cooked. Empty the hot oil in a large pot (to be later disposed of). Pour the vinegar (one wine glass to start) in the pan (carefully, as it might steam/spray) and bring up to heat again. Retrieve the pork chops and quickly dunk them in the boiling vinegar, both sides for 5 to 10 seconds for each pork chop. When there are no pork chops in the pan you can add more vinegar if it’s running low. Take them out and place them again on a new absorbent layer of kitchen towel. Sprinkle each pork chop with a little bit of salt.